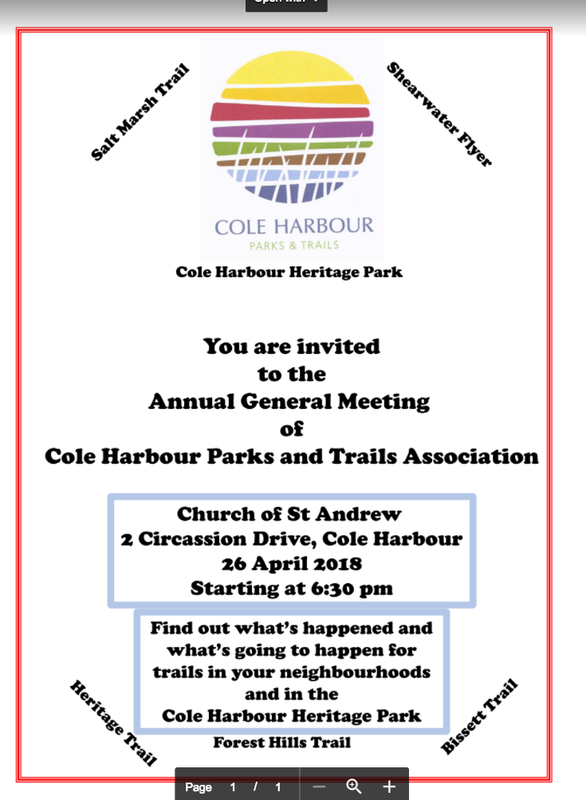 It will be held Thursday 26 April 2018 at the Church of St Andrew 2 Circassion Drive just off the Forest Hills Parkway. The doors will open at 5:30pm with a meeting start at 6:00pm. A reception will follow. For our local politicians and trails staff - RSVP to chairchpta@gmail.com or by text or phone to 902-435-3952. The AGM will be quite busy therefore the Board opted to not have a guest speaker for the meeting. CHPTA intends to host presentations dealing with issues of interest like the HRM Green Network Plan, changes to park and trail regulations and the upcoming negotiations with DNR on a Park and Trails Management Agreement over the next year. For current members: please fill out a membership form with the latest information, circle the renew option and mail it in or bring the form with you along with your membership dues ($5.00 per person per year) For those interested in joining, please fill out the form and send it in by mail. If received before the end of March, you will be able to vote at this AGM. You can bring in the form to the meeting, but will not be able to vote until the next members' meeting. that CHPTA approve the revised By-Laws as presented to the members 26 April 2018 (document “Proposed CHPTA by-Laws AGM2018.pdf”) and file the new By-Laws with the Nova Scotia Registry of Joint Stock Companies immediately. Please bring your own copies of any documentation being used at the AGM either in electronic or hard copy format. There will be a very limited quantity of documents available at the meeting. 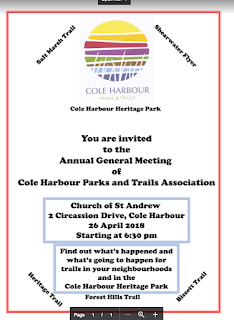 To encourage volunteer membership in the Cole Harbour Parks and Trails Association for the purpose of promoting and coordinating the construction and maintenance of parks and trails in the Cole Harbour area of Halifax County.